Take out the leader, and the rest of the pack panics. Back in 2001, a little show called 24 hit the small screen. Jack Bauer, expertly played by Kiefer Sutherland, as a member of LA’s Counter-Terrorist Unit (CTU) “raced against the clock to subvert terrorist plots and save his nation from ultimate disaster” – as IMDb puts it. And I was there for every second of it! There were plots and sub-plots, bad guys, good guys, bad guys who became good guys, good guys who became bad guys, good women, bad women, and worse women… and in the middle of it all, there was Jack Bauer just trying to save the country from destruction over and over again. It was easily one of my favorite shows. So it was no surprise when, later, another little show called Scandal rocked my world. Once again, it was a highly skilled team (lead by one amazing person) rescuing us from devastation. This time Olivia Pope, played dynamically by Kerry Washington, advised the hell out of everybody in the White House and beyond, managing crises that threatened all sorts of highly ranked officials, including the president himself. So why wasn’t I into reading this book at first? Primarily, I think that I assumed that it wouldn’t be any good. #Truth. I mean, really – a fiction novel written by a former president? Pass. I was initially less than interested. It didn’t even tickle my reading radar at all. Then, one morning while I was dressing to go spend a day of vacation on the beach in Hilton Head, I watched an interview with Bill Clinton and James Patterson about the book, its storyline, and why they wanted to write it. By the end of the interview, I was sold. They both spoke about including authentic action in response to real-life scenarios that are very genuine threats to national and international security. And Patterson mentioned that he consulted with Bill Clinton specifically to make it as detailed as possible and to get all the facts right. I love authenticity in books. It says to me that even though a story may be fictional, the author cares enough about it to get it right. After reading this book, I am glad that I saw the interview and totally satisfied with my decision to change my mind and check it out. It is – at its essence – a James Patterson book. If you’re familiar with his writing style, you will feel his touches and patterns throughout the story. However, I was also distinctly aware of President Clinton’s experienced voice weaving within the narrative, especially (and not surprisingly) in the character of President Duncan. Duncan is the president that Clinton aspired to be and that I wish we had today. Strong, but flawed; brave, but cautious; powerful, but compassionate. The story shows us all these sides of a heroic leader who is battling threats to his command on both foreign and domestic fronts. When the mountains and molehills all look the same, campaigns and governments devote too little time and energy debating the issues that matter most to our people. Even when we try to do that, we’re often drowned out by the passion of the day. Here’s a little of the plot without spoilers: President Duncan faces one of the most difficult weeks in his life. He is asked to attend a congressional hearing that will decide if he is to be impeached, he is also notified that a cyber terrorist is planning to detonate an Armageddon-level attack on the United States, and a chronic infirmity of his is once again rearing its deadly head. Duncan knows there is a mole within the White House, and it’s one of his most trusted Circle of Eight. He must figure out who he can trust before the cyber-terrorist strikes and plunges the entire nation back into the Dark Ages. The Wild, Wild West, this cyberterrorism. This new, scary frontier. Anyone sitting on a couch in his underwear could undermine the security of a nation. It’s set in real time over the course of 4-5 days with a large cast of sufficiently fleshed-out characters. There’s a lot of political instruction (not the most enjoyable), a lot of misdirection (entirely enjoyable), and multiple points of view which keeps the action interesting and fluid. The President is Missing is heavy on the patriotism, equally involved with explanations of certain key members of all three branches of government and their duties, and reverently appreciative of how indispensable the secret service is to the protection of our nation’s leaders – none of which I ended up minding even though it seemed to slow the action down significantly at times. I could really feel Clinton’s expertise and admiration in those chapters and it made me appreciate his in-depth contributions. Despite an epilogue that came across as a bit long-winded and too patriotically “preachy” (but on its face was meant to inspire and unite us – I could practically hear Lee Greenwood’s “God Bless the USA” playing in the background during the president’s speech), I enjoyed this book and have already recommended it to others who also enjoy James Patterson, political fiction, and a few select friends who really enjoy a good thriller with a stealthy terrorist plot! Listen to an excerpt of the audiobook here. William Jefferson “Bill” Clinton (born William Jefferson Blythe III) was the forty-second President of the United States, serving from 1993 to 2001. Since leaving office, Clinton has been involved in public speaking and humanitarian work. He created the William J. Clinton Foundation to promote and address international causes, such as treatment and prevention of HIV/AIDS and global warming. In 2004, he released a personal autobiography, My Life. I must say, I wouldn’t normally pick up a book with this type of premise: I’ve never seen an episode of 24 *ducks for cover*, the whole terrorist-threat-then-a-good-guy-with-a-gun-saves-the-day kind of thing doesn’t appeal tome… BUT I think that’s because I end up sitting there thinking “surely that couldn’t happen, there’s no way that this would be how they’d respond” etc. 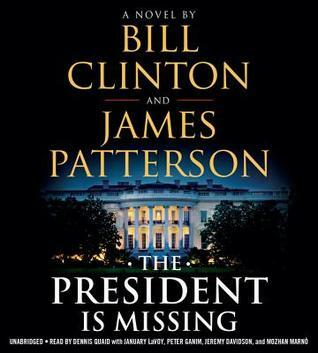 So, The President Is Missing actually REALLY appeals to me, precisely because Clinton contributed so much to its creation and I guess I feel a bit reassured that the creative license is in check and he wouldn’t let Patterson’s imagination run too wild. Plus, you clearly enjoyed it, so that’s another tick in its column 😉 Can’t wait to read it! That is exactly what attracted me to it as well. This book was NOT on my radar, but because he and Patterson said that they put in just enough to be truthful without giving away every secret, I felt confident that it was pretty close to what would actually happen!